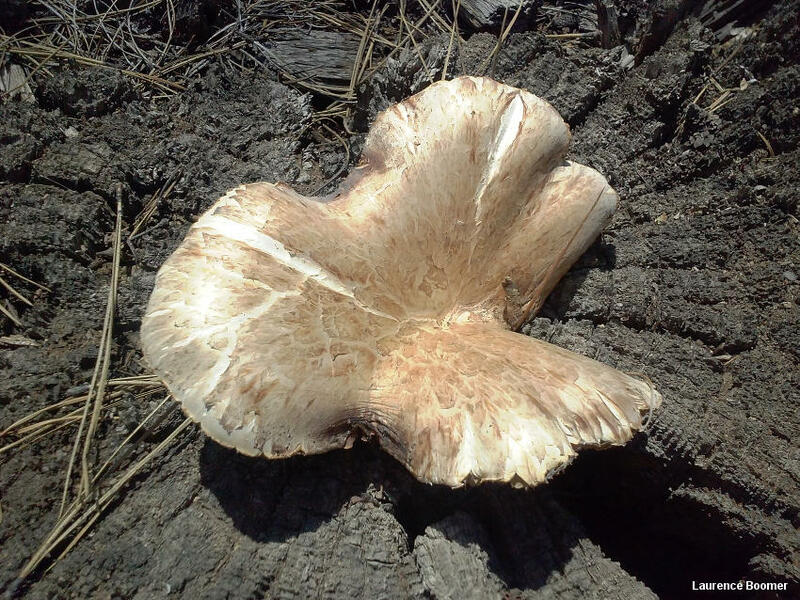 Enormous and tough, Neolentinus ponderosus is usually found on well-decayed stumps of ponderosa pine, although it also appears on the wood of other western conifers. 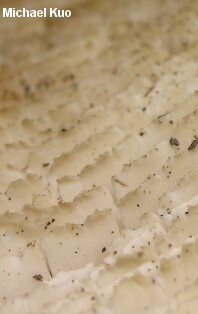 It features a cap that is covered with brownish, appressed scales, along with white gills that have serrated, jagged edges. The stem is finely scaly, especially in age, toward the base. 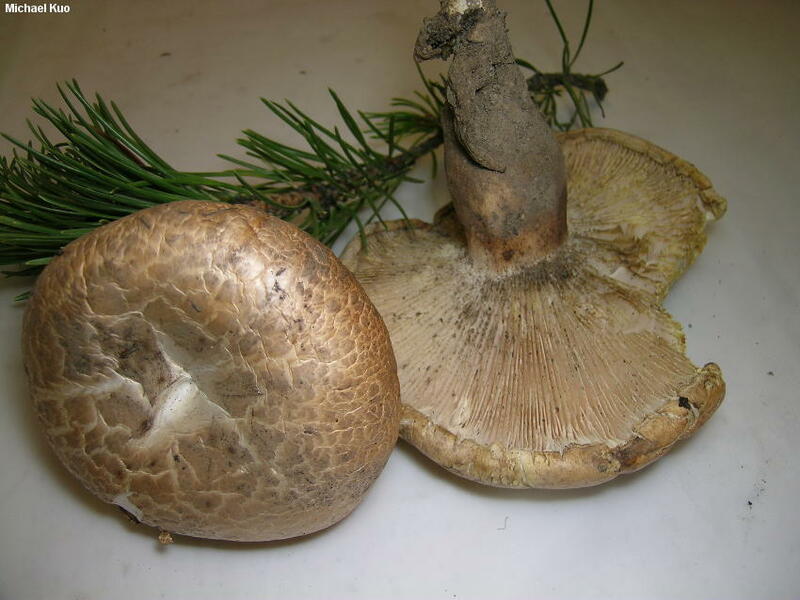 Despite its large size it tends to appear in the hotter, drier summer months, rather than the wet, rainy fall season that triggers the appearance of so many of our western North American mushrooms. Mycologists have long wondered where to place Neolentinus ponderosus and its close relatives in the grand scheme of myco-evolution. Because of its hyphal structure and the fact that it causes a brown rot, it was suspected to be more closely related to polypores than to gilled mushrooms, despite its gills. But a 2005 DNA study (Binder et al.) found Neolentinus to be closely related to Gloeophyllum sepiarium, which is currently placed in the Gloeophyllales, far from the traditional polypores. Lentinus ponderosus is a synonym. Thanks to Laurence Boomer for collecting, documenting, and preserving Neolentinus ponderosus for study; his collection is deposited in The Herbarium of Michael Kuo. Ecology: Saprobic on well-decayed, bark-less logs and stumps of ponderosa pine and other conifers; growing alone or in small troops; summer; western North America. The illustrated and described collections are from Colorado and Oregon. Cap: 5-30+ cm across; convex, becoming broadly convex; dry; buff to pinkish and bald underneath with large, brownish to brown, appressed scales; the margin inrolled at first. 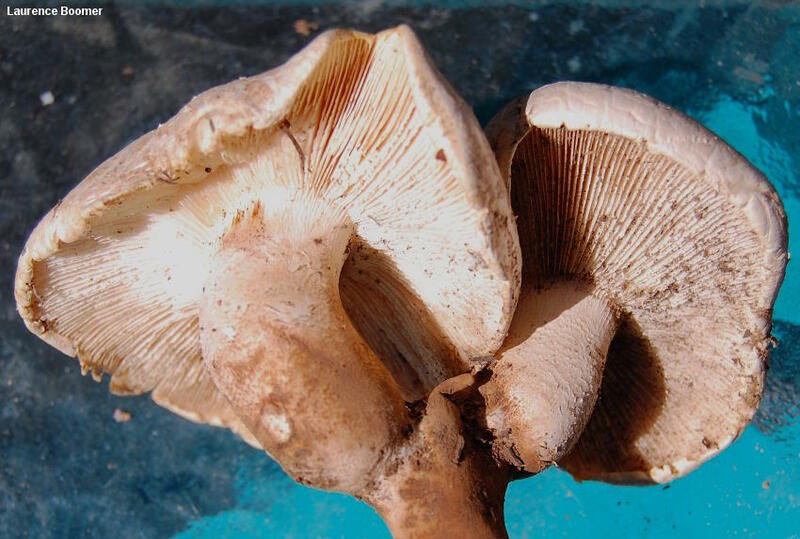 Gills: Broadly attached to the stem; close; short-gills frequent; white to orangish white; edges serrated. Stem: 3-10 cm long; 2-5 cm wide; equal, or with a slightly swollen or tapered base; dry; finely scaly or laterally ridged, with scales becoming reddish brown toward the base; without a ring; whitish to brownish; very tough. Flesh: White to pinkish white; very tough; unchanging when sliced. Odor and Taste: Odor not distinctive, or somewhat fragrant; taste not distinctive. 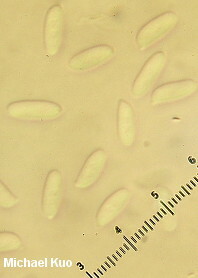 Microscopic Features: Spores 9-11.5 x 3.5-4 µ; subcylindric; smooth; thin-walled; hyaline in KOH; inamyloid. Basidia 4-spored. 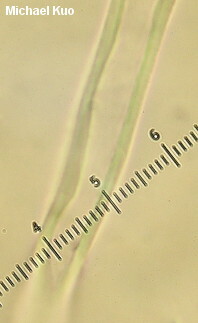 Hymenial cystidia basidiole-like to hypha-like. Pileipellis a cutis. 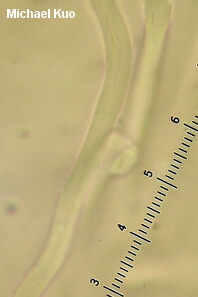 Hyphal system dimitic at maturity; skeletal hyphae 8-10 µ wide, smooth, hyaline, walls about 1 µ thick; generative hyphae 3-9 µ wide, smooth, thin-walled, hyaline, clamped at septa. REFERENCES: (Miller, 1965) Redhead & Ginns, 1985. (Pegler, 1983; Arora, 1986; States, 1990; Lincoff, 1992; Bessette, Miller, Bessette & Miller, 1995; Binder et al., 2005; Miller & Miller, 2006; Evenson, 2015.) Herb. Kuo 08161301.